You are currently browsing the tag archive for the ‘call for papers’ tag. The conference “Access and Allocation in the Anthropocene” addresses questions of equity, justice, and fairness in environmental governance as well as transformative pathways towards sustainability. The call for papers draws on the analytical concepts of access and allocation, architecture, agency, adaptiveness, and accountability which structure the Earth System Governance Project (ESG). This scientific network is one of the co-organizers next to the University of East Anglia and the Tyndall Centre for Climate Change Research. Research on racism has mostly focused on territorial states and its politics, claims a recent call for papers just published by Gerhard Wolf in the forum of H-Soz-Kult. However, the phenomenon itself is clearly not bound to territorial borders. A two day workshop at the University of Sussex titled “Everyday Racism in Transnational Perspective” attempts to widen the scientific angle of vision on the radical construction of race. Suggested topics of workshop contributions include, inter alia, racism and the marketplace, pop culture, religion, family or education. The workshop takes place from October 31 to November 1, 2013. Deadline for applications is April 30. Scholars engaged in this topic may also be interested in an older post about the Journal of Comparative Fascist Studies’ call for papers on fascism as a transnational concern – although the two phenomena are distinct. 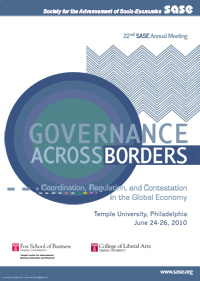 This year’s conference focuses on the development, dynamics, impact, and implications of emerging forms of transnational governance in the global economy – public, private, and hybrid. So not only because this blog bears the same name as is this year’s conference theme, we greatly encourage submitting paper or session proposals at the conference website. Besides, we are thankful for receiving the honor of being SASE’s “featured blog“.